In making Ekawada a free app, one of my hopes is that people with little or no experience with string figures might be tempted to download it and give it a try. But a list of string figures and some cryptic instructions are not going to be particularly encouraging to these newcomers; I needed to make sure that Ekawada was suitably welcoming to them, without getting in the way of more experienced users. The first screenshot is the home screen, which is the first thing a user will see when they open Ekawada. It includes a limited set of options, and the very first one the user will see is labeled “New to string figures?”. If they tap that option, they’ll be shown the second of these three screenshots: the tutorial list. 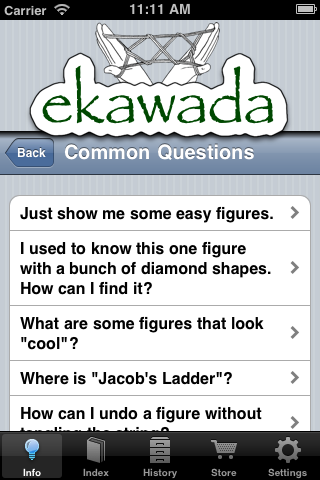 Ekawada will ship with 9 tutorials initially. These range from selecting your first string, to basic string maneuvers like the Navaho and loop exchanges. These tutorials are intended for rank beginners, and are focused on teaching things like how to read the notation used in the instructions. The tutorials also include links to some of the included figures, to encourage people to apply what they’ve learned. If, however, you’re not a complete neophyte, you might not identify as “new to string figures”, but you may still have questions about Ekawada itself. If so, the second option in the list is intended to attract your attention: “Got a question?” Tapping on that option will take you to the third screenshot: “Common Questions”. There aren’t a lot of questions here right now: just six things that I expect people might want to know. As I get feedback from people using Ekawada “in the wild”, I’ll grow that list. I’m sure that as the app gets used, deficiencies in my approach here will surface. In the end, the best anyone can do is guess until the app gets put in front of real people, but I’ve tried to anticipate some of the common concerns. Ekawada is currently “in review”, according to iTunes Connect, and has been since Monday morning. I’ll post as soon as I have more news. You can bet I’m refreshing iTunes Connect some few times per day! I’ll be heading to New Orleans tomorrow for RubyConf, but if I’ve got some time while I’m there, I’ll try and do another post this week focusing on the Ekawada store, and the process I went through deciding how to organize the initial offering of figure sets.